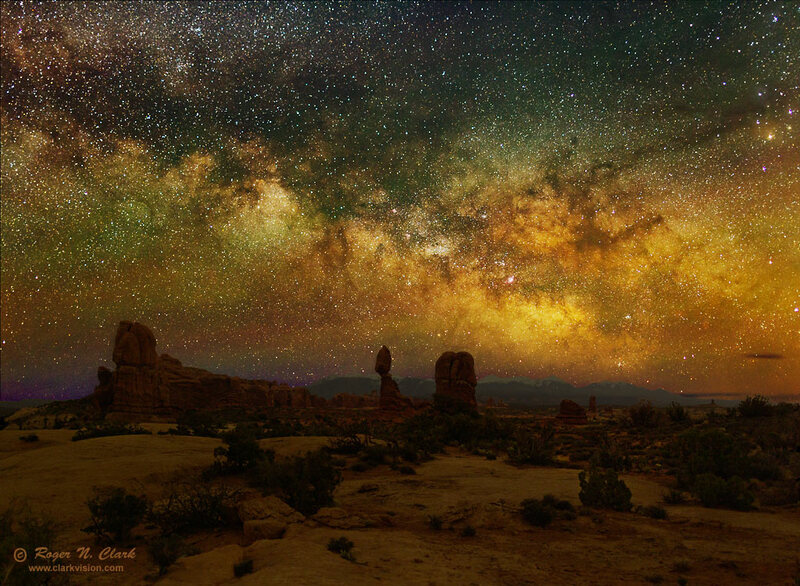 The awesome view of Balanced Rock in Arches National Park, Utah is dwarfed by the rising galactic center of the Milky Way. In the distance are the snow capped La Sal Mountains. The sky background appears striped red and green from airglow, molecules in the Earth's atmosphere excited by solar ultraviolet radiation. The galactic center is the bright region to the right of Balanced Rock, above the mountains, and is in the constellation Sagittarius. Technical. Canon 1D Mark IV 16-megapixel digital camera, 24 mm f/1.4 lens at f/2, ISO 1600, combination of 4 exposures: three tracked 30-second exposures were averaged for the sky, and one 2-minute exposure fixed for the landscape, then the sky and land combined. Tracking was by hand cranking a barn-door mount.